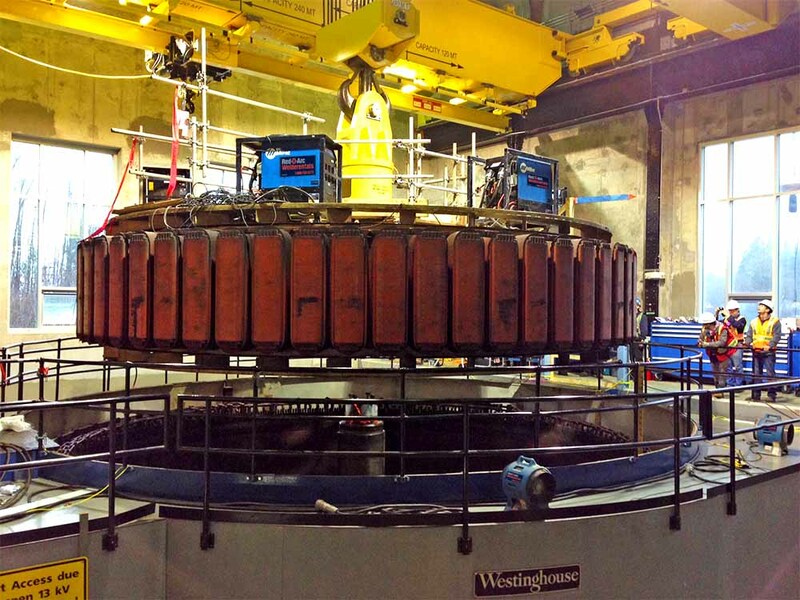 A customer involved in the rebuilding of a hydroelectric power generation station came to Red-D-Arc with a unique challenge: Use induction heat to help separate a massive rotor from its center shaft assembly. A traditional approach is to use a combination of open flame along with dry ice which would have taken several weeks to set up and also ran the risk of being ineffective due to the scale and complexity of the project. Sil Nonis, an induction heating specialist at Red-D-Arc, suggested using 6 induction heating units activated in sequence to provide thermal growth in a uniform pattern; releasing the interference from the center shaft before lifting the rotor. The 6 Miller ProHeat 35 Induction Heating Systems powered two half circle assemblies, positioned at the bottom of the locking ring which was 5′ in diameter as well as two half circle assemblies positioned on a top locking ring which was 4′ in diameter. Massive rotor arms also had 4 pads attached to them, positioned in sequence. Setup took approximately 2 days and removal of the rotor was completed in a single day. The same process will be used to reinstall the rotor after it has been rebuilt. Over the next few years two additional rotor assemblies will be removed, rebuilt and reinstalled using the same process.